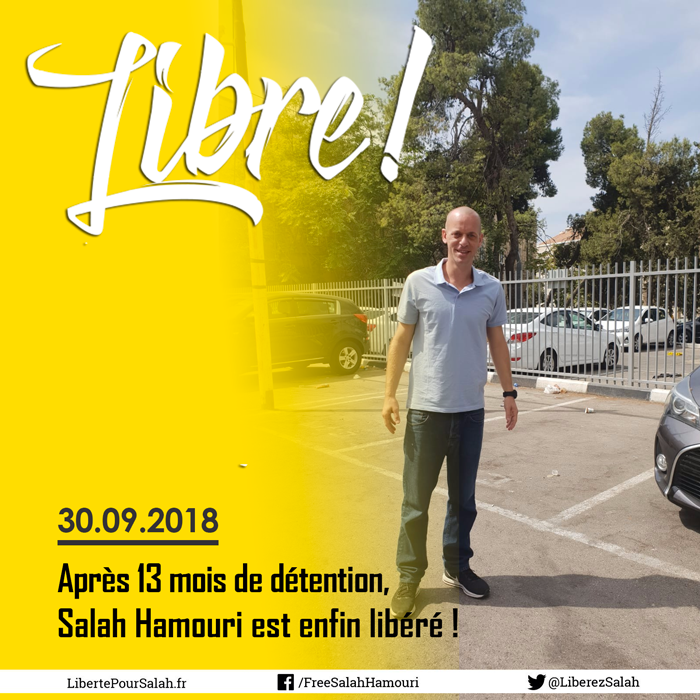 French-Palestinian lawyer Salah Hamouri was released by the Israeli occupation on Sunday, 30 September after 13 months of imprisonment without charge or trial under administrative detention. His release was accompanied by Israeli harassment and repression and was met with joy by his family, comrades and the support committee in France which had organized events across the country and internationally to demand Hamouri’s release. After he was released from the Negev desert prison, he was taken to the Moskobiyeh interrogation center in Jerusalem and released, preventing his family and friends from welcoming him upon the moment of his release. Hamouri was seized on 23 August 2017, only three days after being sworn in by the Palestinian Bar as a lawyer, and ordered held in administrative detention – jailed without charge or trial. Hamouri, a staff researcher at Addameer Prisoner Support and Human Rights Association, was subjected to repeated detention orders. Over 1,700 elected officials in France signed a statement demanding his release and dozens of cities and towns officially passed resolutions for his release. Hamouri was previously jailed for six and a half years by the Israeli occupation before being released in the Wafa al-Ahrar prisoner exchange in 2011. He is married to Elsa Lefort, with whom he has a son, Watan. She is banned from entering occupied Palestine and was subject to detention and deportation while pregnant before Hamouri’s arrest. He was also banned from the West Bank while attending law school, delaying his graduation. 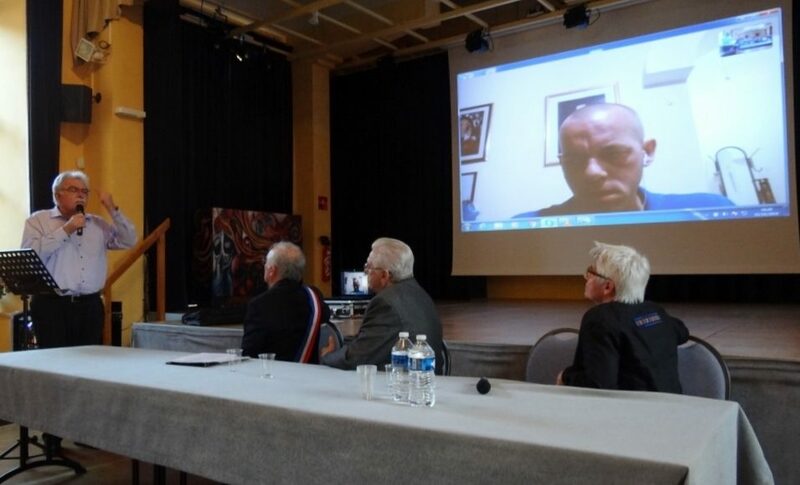 Hamouri’s release was celebrated in Aubière, France, on 5 October, where a ceremony was planned to name him an honorary citizen of the city, as reported by AFPS 63. Salah himself joined the event live over Skype and was greeted with loud applause. Several elected officials in the region were present, including Francois St. Andrew, councillor and former mayor of Beaumont; regional councillors Boris Bouchet and Catherine Fromage; Nadia Forte, deputy mayor of Blanzat; Clermont-Ferrand councillors Magali Gallais, Pierre Miquel and Nicole Prieux; Delphine Lucard, councillor of Blanzat as well as 13 councillors of Aubière. Mayor Christian Sinsard expressed his pride in organizing this event in Aubière, a town of over 10,000 inhabitants. 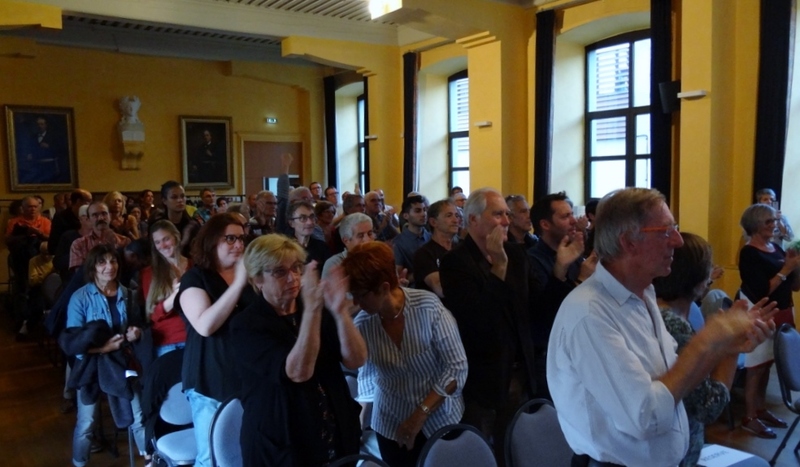 André Chassaigne, Communist deputy of Puy de Dôme, said that the members of his group in the National Assembly saluted the commitment and tenacious energy of Jean-Claude Lefort, former deputy, activist and Hamouri’s father-in-law, in struggling for Palestine, especially prisoners’ rights. He also expressed his thanks to the AFPS 63 for their dedicated organizing for Hamouri’s freedom. 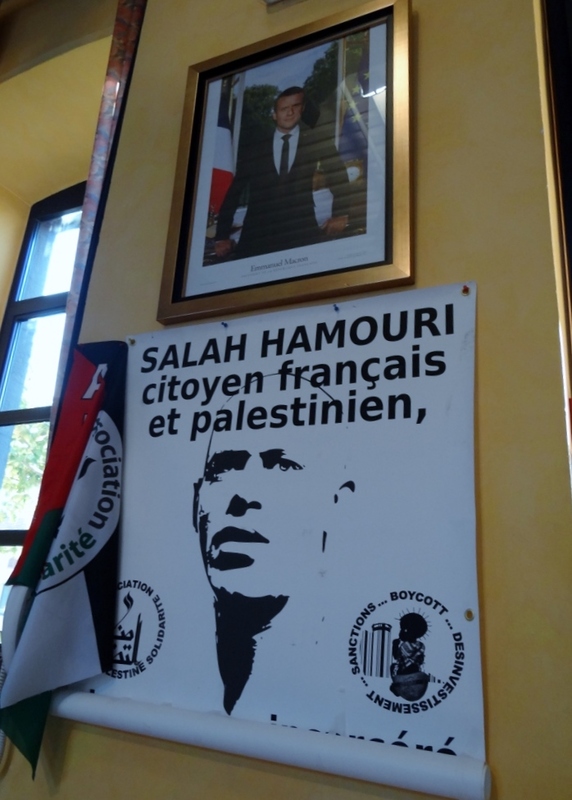 Lefort, honorary president of the AFPS and coordinator of Hamouri’s support committee, reviewed the past 13 months of struggle for Salah’s freedom. He denounced France’s shameful attitude against one of its own nationals, while even the UN denounced his arbitrary imprisonment. He also noted that the struggle of Palestinian prisoners goes beyond the case of Salah Hamouri, noting also that Palestine bears the open wounds of ongoing injustice and colonization. In AFPS 63’s presentation at the event, they emphasized that justice in Palestine is the key to regional peace. For this to be achieved, they urged all to join the BDS campaign, one of the most effective, popular campaigns to end Israel’s policy of attempting to erase the Palestinian people and liquidate their rights. They also emphasized the struggle of Palestinian prisoners, including child prisoners and administrative detainees and leaders like Marwan Barghouthi and Khalida Jarrar. They also raised the struggle of Georges Ibrahim Abdallah, imprisoned for 34 years in France despite being eligible for parole for 19 years. The event ended with Salah’s intervention from Palestine, who thanked the municipality, the attendees and all those struggling in France and elsewhere to free Palestinian prisoners. He also emphasized the importance of writing letters to prisoners, saying that “every letter received is like a sun that illuminates the cell and helps the will to resist the Israeli authorities’ goal to erase all humanity.” Hamouri’s presentation was followed by a standing ovation. The evening continued with a screening of Franck Salomé’s film, “Palestine: la case prison” that dissects the use of Israeli imprisonment against Palestinians. During questions and discussions, Jean-Claude Lefort emphasized the need to expand campaigns to free Palestinian prisoners across Europe as well as the importance of the BDS movement. In particular, he discussed the sports boycott, noting that the boycott of South Africa was strengthened immensely through the sports boycott; he also discussed the boycott of Eurovision 2019 in Israel. Participants noted the absence of local media at the event, with an attitude no different than that of the national media; with a few exceptions, few raised the case of Salah during his detention. The case of French-Israelis serving in the Israeli army was also raised, particularly as it highlights the question of France’s attitude toward Palestinian rights and its disregard for them. The discussions continued around a buffet organized by the municipality, closing an evening of celebration for which the participants’ joy was not complete without the freedom of Palestine. Here I am, finally free after 13 months of detention in a dark prison of the occupation. 13 months without ever knowing the reason for my detention. 13 months without knowing when I will find freedom. 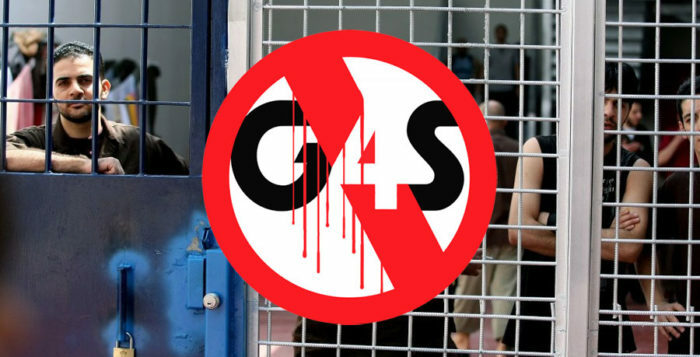 I know the prisons of the occupier and its prison system, but this new detention confirmed once more the fact that the occupation is bent on breaking men, women and children. Prison is a way to isolate the Palestinian people, collectively. In these prisons, everything is done to take away our humanity. We are cut off from the world, from our relatives. The occupation restricts our access to the press and the television so that we can not inform us properly about what is happening outside. We can not freely study or receive books or any mail. We’re denied our families, one visit per month allows us to see our first-degree relatives only for 45 minutes, behind glass, through phones, our personal conversations being listened to carefully and analyzed in order to put pressure on us. Certain detainees are sometimes deprived of these visits, arbitrarily. For my part, I was deprived of my wife and son during those 13 long months, a real psychological torture for us three. But in the darkness of this prison, I experienced rays of sun that warmed my heart. My lawyers and parents kept me informed of the mobilizations in France, Belgium and even further in the world. Back in my cell, I would inform my fellow prisoners. I want to thank you all warmly for your mobilization, your diverse and varied actions, rallies, debates, film screenings. Many pasted posters, signed petitions, distributed leaflets, demanded the Government take action for my freedom, all you have done has touched me deeply. I must tell you today. Thank you to the citizens, the activists political parties, associations and unions, lawyers, artists, intellectuals who pleaded for me during all this time and have never ceased their activity. Thank you to the elected officials that carried my name and the demand for freedom in the cities, counties, regions of France, the National Assembly, the Senate and the European Parliament, who posted banners on the streets and public buildings, and that made me an honorary citizen. Know that it is also an honor for me to be well defended by the French people and their representatives. Thank you to the few media and journalists who spoke of my detention, while the majority of their colleagues preferred to lock me in a second prison, one of silence and indifference. You give credit to your profession, you who are acting despite the pressure, preferring the truth to your personal comfort. Finally, thank you to the core of this Committee who tirelessly organized events and sustained the campaign, alongside Elsa and Jean-Claude. Those who always held the line, despite the obstacles and bad days, I know how important your work was important both politically and on a human level. It is your collective action that helped force the French diplomacy to move, when it would rather leave this folder in a drawer. It is your collective action that sent a clear message to the occupation, that the solidarity of the peoples of the world will not stop and that they will keep on the path required, marching alongside the Palestinian people for their legitimate rights of freedom and independence, like all peoples of the world. It is together that we will write this page of history, we Palestinians, you and our global solidarity. Again, many thanks to all. I hope to come soon to France, first to find my wife and my son which I am now deprived for 16 months and then come to thank you, to continue the fight for my many still-imprisoned comrades and to defend ceaselessly the fundamental rights of my people. See you soon, dear friends! 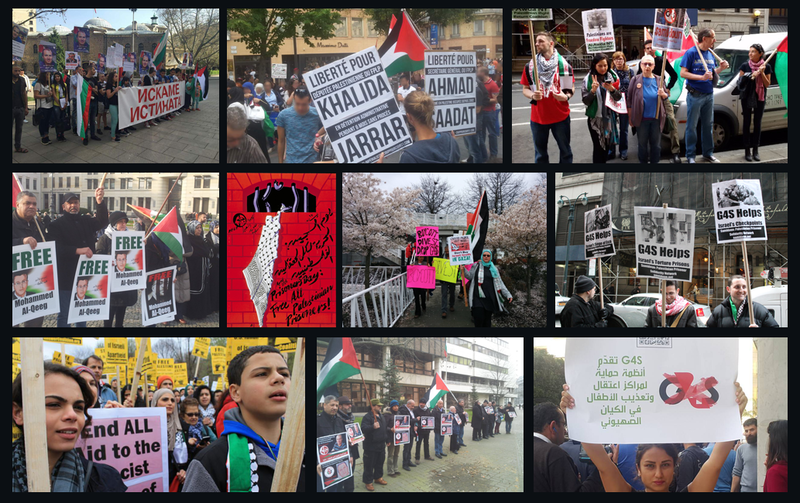 Samidoun Palestinian Prisoner Solidarity Network salutes Salah Hamouri on his liberation. We salute all of those who joined the struggle for his freedom and who helped to force the occupation to release him, in France and around the world. We know that he will never cease to be in the front lines of struggle to free his fellow Palestinian prisoners and to free Palestine!